Leading biomechanics supplier becomes the UK’s authorised distributor for global market leader for robotic and sensor-based movement therapy devices. As Hocoma’s sales partner in the UK, Summit Medical and Scientific now offers the Total Solution of Hocoma products, including the latest Andago, as part of their gait and balance solutions. Created in 2016, the Andago is the world’s first mobile gait robotic device with a body weight support system. This innovative device is revolutionising research and rehabilitation within clinical settings, benefiting patients and therapists alike and bringing safety, user-friendliness and innovation to clinics, centres and hospitals. Other Hocoma products include the Lokomat (a robotic-assisted gait therapy solution), the Erigo (a robotic tilt-table with assisted leg movement), the Armeo (a robotic exoskeleton which enables patients to practise and repeat movements with their hands and arms) and the Valedo (a medical sensor device for digital back therapy). In 2016 Hocoma merged with DIH International and formed a partnership with Motek, also a DIH company and Summit Medical and Scientific partner. Their combined vision is to improve millions of lives across the globe by creating functional and efficient solutions which set the standards for human movement therapy. Hocoma joins Summit’s wide range of gait therapy and analysis products from fellow partners including Motek, AMTI, Treadmetrix and Myon. Sara Brammall, Managing Director at Summit Medical and Scientific, said: “We are proud to become Hocoma’s first UK distributor for the Andago, Armeo, Erigo, Lokomat and Valedo. These are exciting products which are ground breaking clinical solutions for movement therapy. 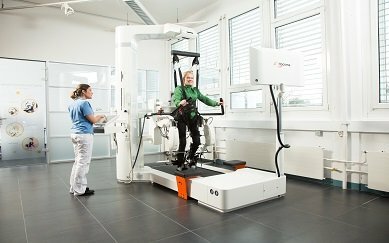 Hocoma’s expertise in the field of gait robotics further enhances our current offering of rehabilitation products, and we look forward to enjoying a successful partnership together. To find out more and for a free, no-obligation quotation, please contact us.